The Apple Corporation wants lawmakers in Washington to once again grant a repatriation tax holiday – this time for up to $1.7 trillion in profits that multinational corporations are holding offshore. Federal law allows corporations to “defer” paying U.S. income taxes on these foreign profits until they are brought back or “repatriated” to the United States. This tax holiday is being sold to the public as a boon to new investment and job creation as it was sold to Congress in 2004 when the first repatriation holiday was enacted. Under that scheme, corporations were able to bring their profits back and pay a tax rate of no more than 5.25 percent – rather than the statutory rate of 35 percent or a lower effective tax rate. 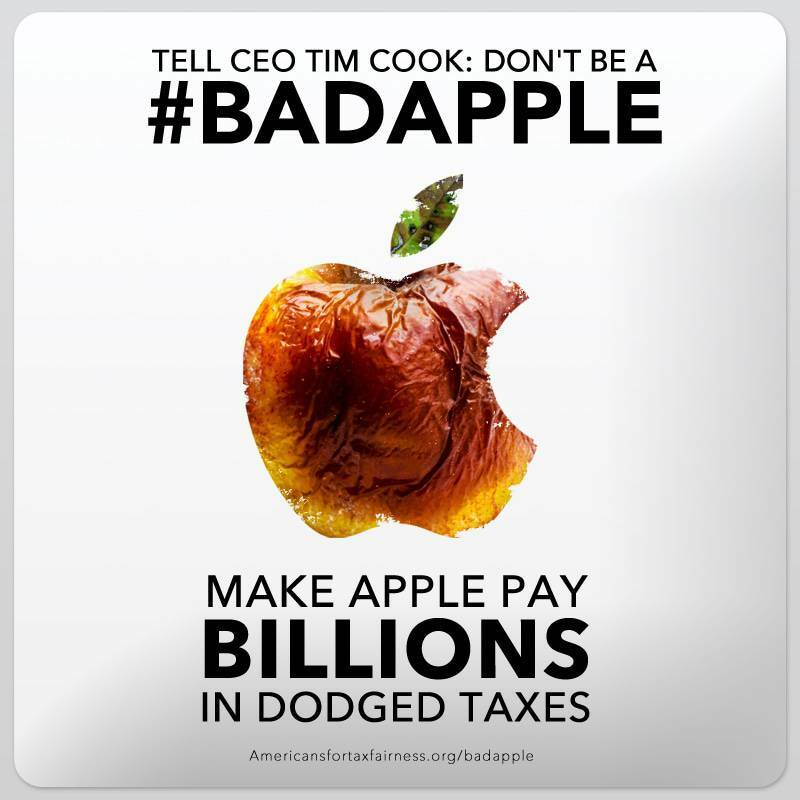 Apple may even be working with many of its multinational colleagues to push for a territorial tax system, another huge giveaway to profitable corporations at the expense of all American taxpayers. A territorial tax system is in effect a permanent repatriation tax holiday. Under it, U.S. corporations would never have to pay U.S. corporate taxes on their overseas profits, thereby encouraging companies to use numerous tax dodges to shift capital to overseas tax havens that assess little or no corporate income tax, risking wages and jobs at home. It’s time for Apple to start paying its fair share of taxes and for the U.S. Congress to reform the tax system so that companies like Apple can no longer defer paying taxes on their profits no matter where they are earned. If deferral were ended it would not matter which tax loopholes a company used to shift its profits to overseas tax havens – those profits would still be subject to U.S. taxes, minus the taxes paid in the jurisdiction where they were claimed as earned. Apple had $82.6 billion in offshore profit holdings in 2012, much of it in tax havens, on which the company owes U.S. federal income taxes. Apple says it would owe $28.5 billion on these profits if it brings them back to the United States – $14.7 billion in deferred tax liabilities overseas and another $13.8 billion in “unrecognized deferred tax liability” from money it intends to keep perpetually out of the U.S.[viii] That’s nearly a 35 percent tax rate, which means nearly all of Apple’s overseas profits are in tax havens that charge little if any corporate income tax. Foreign corporate profits are not subject to U.S. tax unless and until they are brought back (or “repatriated”) to the United States, which encourages U.S. companies to ship profits and jobs overseas. Ending the current practice of deferral, which allows corporations to avoid U.S. income taxes on offshore profits until they are brought back to the United States, would raise $590 billion over ten years according to the Congressional Joint Committee on Taxation. [xiv] Ending deferral would result in taxing the global profits of U.S. corporations minus the taxes those companies pay to foreign governments (the “foreign tax credit”). [iii] Paid2Trade.com, “Apple Form 10-K Fiscal Year Ending September 30th 2012 (Nov. 2, 2012). [xi] Op cit, Tax Analysts. [xiii] Kimberly A. Clausing, “A Challenging Time for International Tax Policy,” Tax Notes (July 16, 2012). [xv] Op cit, Tax Notes.